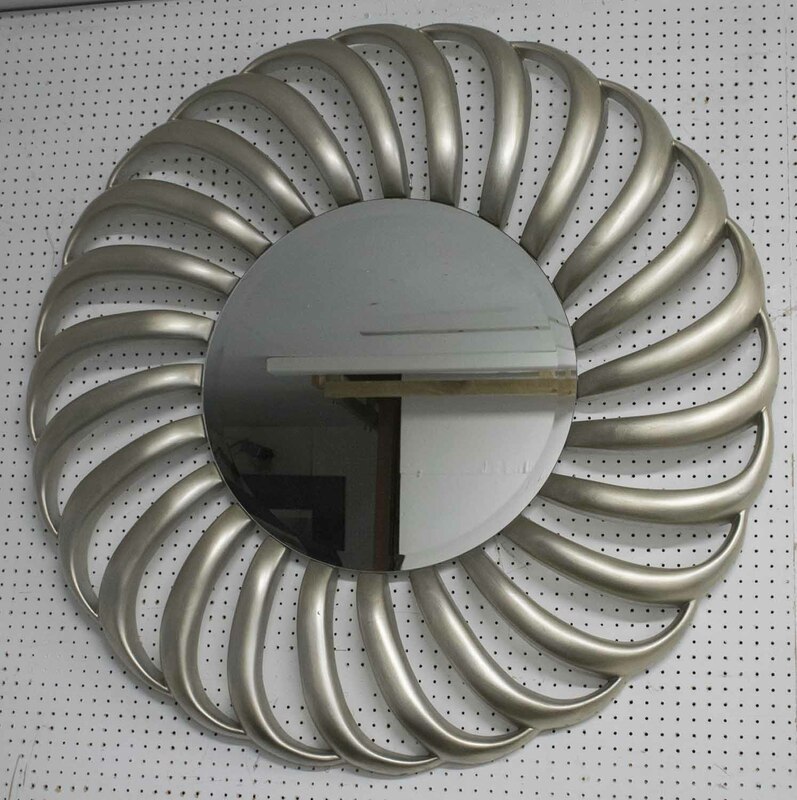 SUNBURST MIRROR, circular bevelled mirror within silvered starburst frame, 102cm D.
Unfortunately, your registration has been declined by the auctioneer. You can contact the auctioneer on +44 (0)20 7376 6800 for more information. You are the current highest bidder! To be sure to win, log in for the live auction broadcast on 20 Jan 2019 12:00 GMT or increase your max bid. Lots Road Auctions does not ship or provide a packing service.We request collection of purchased lots by 12 noon Tuesday after the sale. The companies below are known are recommended but are all independent businesses. Please contact us if you need more advice.For deliveries within London. Callaghan & Newbury (recommended carrier) 07903 299810/07794 751445. Deliveries to the Home Counties and has a storage facility.John Charles Transport 07776 130440 John Paterson 020 8337 4350 Pickquick 020 8560 1313 Gordon (Piano) 07956 489223. Addison Lee Estate cars/vans/bikes 020 7387 8888 Mailboxes etc. 020 7352 6344. Lots purchased online with the-saleroom.com will attract an additional charge of 4.95% of the hammer price + VAT at the rate imposed. Payment made direct to Lots Road Auctions, we do not have access to card details held with the-saleroom.com. Lots Road Auctions does not ship or provide a packing service. We request collection of purchased lots by 1pm Tuesday after the sale. The companies below are known are recommended but are all independent businesses. Please contact us if you need more advice. Callaghan & Newbury (recommended carrier) 07903 299810/07794 751445. Deliveries to the Home Counties and has a storage facility. 1. Definitions. In these Lots Road Auctions act only as auctioneers and agents for the seller and the representative of Lots Road Auctions conducting the auction is called the 'Auctioneer'. (a) Each lot as set out in the catalogue or as divided or combined with any other lot or lots sold by the seller with all faults, imperfections and errors of description. All electrical items are untested. (c) All statements whether printed in the catalogue, made orally or in writing as to any of the matters set out in (b) above are statements of opinion only and are not to be taken as being or implying any warranties or representations of fact by Lots Road Auctions unless they have been instructed in writing by the seller to so certify. (d) Any claim under any Statute must be received in writing by the Auctioneers within ten days of the day of the sale. 3. The Auction. (a) The Auctioneer has absolute discretion to divide any lot, to combine any two or more lots or withdraw any lot or lots from the sale, to refuse bids, regulate bidding or cancel the sale without in any case giving any reason or without previous notice. He may bid on behalf of the seller for all goods which are being offered subject to reserve or at the auctioneer's discretion. (b) The highest bidder shall be the buyer except in the case of a dispute. The Auctioneer may at his sole discretion determine the advance of bidding or refuse a bid. If during the auction the Auctioneer considers that a dispute has arisen, he has absolute discretion to settle it or to re-offer the lot. (c) Each lot is put up for sale subject to any reserve price placed by the seller. Where no reserve has been placed (but not otherwise) the seller has the right to bid either personally or by any one person on his behalf (who may be the Auctioneer). (d) All conditions, notices, descriptions, statements and other matters in the catalogue and elsewhere concerning any lot are subject to any statements modifying or affecting the same made by the Auctioneer from the rostrum prior to any bid being accepted for the lot. 4. Rescission. Notwithstanding any other terms of these Conditions, if within fourteen days after the sale Lots Road Auctions have received from the buyer of any lot notice in writing that in his view the lot is a deliberate forgery and within twenty-one days after such notification the buyer returns the same to Lots Road Auctions in the same condition as at the time of sale and by producing evidence, the burden of proof to be upon the buyer, satisfies Lots Road Auctions that considered in the light of the entry in the catalogue the lot is a deliberate forgery, then the sale of the lot will be rescinded and the purchase price of the same refunded. The seller and the buyer agree to be bound by Lots Road Auction's decision. 5. Default. Lots Road Auctions disclaim responsibility for default by either the buyer or the seller because they act as agents for the seller only and therefore do not pay out to the seller until payment is received from the buyer. Instructions given by telephone are accepted at the sender's risk and must be confirmed in writing forthwith. 6. In the event of a sale by private treaty both the seller and the buyer agree to be bound by the General and any Special Conditions of Sale. 7. Third Party Liability. Every person on Lots Road Auction's premises at any time shall be deemed to be there at his own risk. He shall have no claim against Lots Road Auctions in respect of any accident which may occur or injury, damage or loss howsoever caused, save in so far as the injury, damage or loss shall be caused by the direct negligence of Lots Road Auction's employees. 8. Inspection. Opportunity is given for inspection and each buyer by making a bid for a lot acknowledges that he has satisfied himself fully before bidding by inspection or otherwise to all the Sale Conditions, the physical condition of and description of the lot including but not restricted to whether the lot is damaged or has been repaired or restored. It is the buyer's responsibility to measure any item to ensure that it can be accommodated in its intended location. All buyers must check their purchases before the lots leave the building. Lots Road Auctions will accept no claims for loss or damage thereafter. All electrical items are untested. 9. Property and Risk. The legal title in a lot shall not pass to the buyer until the lot(s) has been paid for in full and the Auctioneers shall be entitled to a lien on any lot sold until the purchase price and all charges (as defined in 10 below) are paid in full, but each lot is at the sole risk of the buyer from the fall of the hammer. Each buyer shall forthwith give his full names and permanent address and if called upon to do so by the Auctioneer shall forthwith pay Lots Road Auctions such proportion of the purchase price as the Auctioneer may require. If the buyer fails to do so, the lot may at the auctioneer's sole direction be put up again and re-sold. 10. Every bidder shall be deemed to act as principal unless there is in force a written acknowledgement by Lots Road Auctions that he acts as agent on behalf of a named principal. (b) In the event of any failure of the buyer to comply with any of the above conditions the damages recoverable by the seller or the Auctioneers from the defaulter shall include any loss arising on any re-sale of the lots, together with the charges and expenses in respect of both sales, and together with interest at 2% above HSBC Base Rate upon the price of any lot which has not been paid for within forty-eight hours of the sale, and any money deposited in part payment shall be held by the Auctioneers on account of any liability of the defaulter to them or to the seller. 12. Purchase Price. The buyer shall pay the hammer price together with a premium at the stated rates on the hammer price of 22% + VAT (26.4% incl.). Under the Auctioneers' Margin Scheme operated by HM Customs & Excise, the premium does attract VAT as an addition to the stated premium rate. Certain works by living artists will incur an Artist's Resale Right royalty charge of 4%, when sold with a hammer price of €1000 (approx. £850) or more. Artist's Resale Right royalties are not subject to VAT. 13. Fixed Bids. Lots Road Auctions will execute bids on behalf of intending buyers unable to attend the sale at no charge. Lots Road Auctions undertake to purchase lots as cheaply as allowed by other bids and reserves, but will not be sold for less than 50% of the highest 'Fixed Bid' left. Bids must be submitted in writing (in person or via email) and whilst every care is taken in carrying out instructions Lots Road Auctions cannot be held responsible for errors or omissions made in carrying out such bids. 14. Live telephone bids will be accepted on lots with an estimate of £400 upwards. Telephone bids on lots of a lower value may be accepted at our discretion. Live Telephone, fixed and Internet bids are subject to a 'failure to communicate', it is better to be in the room or leave a bid. Lots Road Auctions offer an online bidding service via www.the_saleroom.com for bidders who cannot attend the sale. Please note that any lots purchased via the-saleroom.com at an additional 4.95% + VAT at the rate imposed on the hammer price. Lot 67 WALL MIRROR, silvered wood in the form of three interlocking circles with bevelled plates, 102cm W.
Lot 69 SOFA, adapted from a white bath with grey velvet cushion on chrome feet, 177cm W.